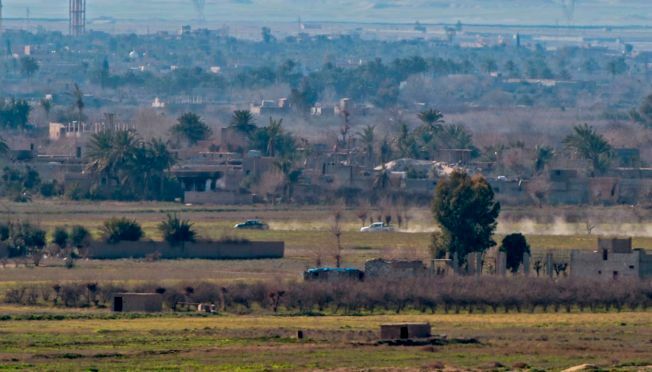 A picture taken from a US-backed Syrian Democratic Forces position shows the Baghouz area in the eastern Syrian province of Deir Ezzor on February 12, 2019 during an operation to expel hundreds of Islamic State group jihadists from the region. A driver working with NBC News in Syria was killed Saturday after a device exploded in the vicinity of a group of the network's journalists, NBC News’ president said. "We are thankful that NBC employees escaped unharmed, however one of the local drivers working with them was tragically killed," NBC News President Noah Oppenheim said in a statement. "Our deepest sympathies go out to his family and loved ones." Oppenheim said that "we are still gathering information from today's events, and are in touch with the driver’s family to support them however we can."